Talk about a wild week in the market! In particular, Thursday and Friday’s tug of war became very volatile, very quick. And naturally, it all happened after some pretty bold steps from the Fed. So in this weekend’s update, let’s recap all this wild back-and-forth. After that, we can delve into some individual stock charts that are still holding up well and might be worth a look if the market can get moving again. So first things first, I want to highlight just how intense the crazy swings were this week. Because after Fed Chairman Powell finished speaking Wednesday afternoon, markets really went on a wild ride! It’s hard to believe the first quarter of 2019 is already coming to a close. But lucky for bulls, it’s been a really great rally from nearly start to finish. Now granted, this did come on the back of a violent drop to end 2018. So with stock prices back from where they came, maybe some more volatility is what we should expect as underwater buyers are made even, and consider taking some exposure off the table. 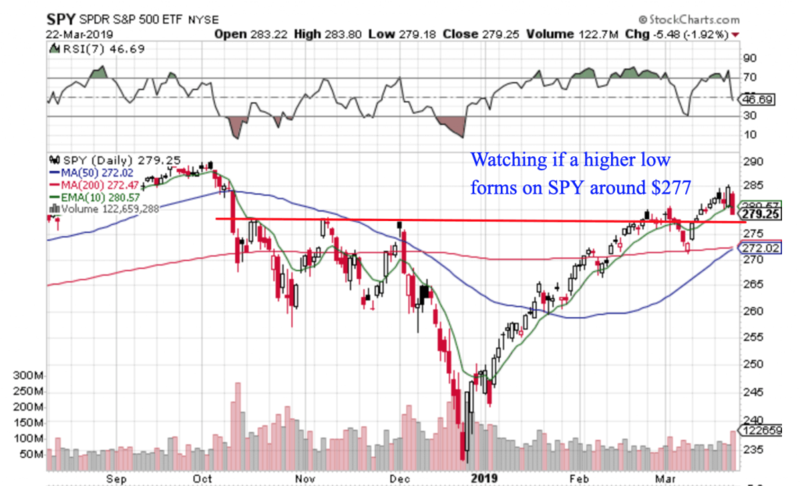 To show you what I mean though, here’s the daily chart of SPY. As you can see it ended up fading lower on Friday, after surging on Thursday. And I’ve got to admit, this was a pretty dramatic end to the week. Because just a few hours after tagging a new closing high for the year, sellers came out in force and pushed prices lower into the weekly close. Now one day does not make a downtrend. And I think there’s a good case to be made this is still just a pullback (albeit a violent one) in the 2019 recovery rally. For example even though my portfolio of momentum stocks was hit hard Friday, a lot of the charts don’t have serious technical damage (i.e. lower lows). And looking at breadth measures, the NYAD remains near highs while FinViz shows about 50% of stocks still above their 50-day moving average. I’m not getting complacent though. Because there are a couple of concerning charts I want to point out that I think will be worth keeping an eye on this week. For starters, small cap stocks have really been lagging recently. Unlike the S&P-500 and Nasdaq indexes, the Russell 2000 small cap index hasn’t been able to make a new high in March. In addition to making a lower high, you can also see small caps have now made a lower low after stalling out at their 200-day moving average in March. The bottom pane of the chart above also shows how small caps have lagged compared to the large-cap S&P-500. And the reason I’m quite concerned here is because as you probably remember, back in September and October, it was small caps that started breaking down first (before rest of the market quickly followed!) So as you can appreciate, I’m getting a little more cautious as small caps finish the week at their lows. Another growth-centric part of the market has been the semiconductor stocks. 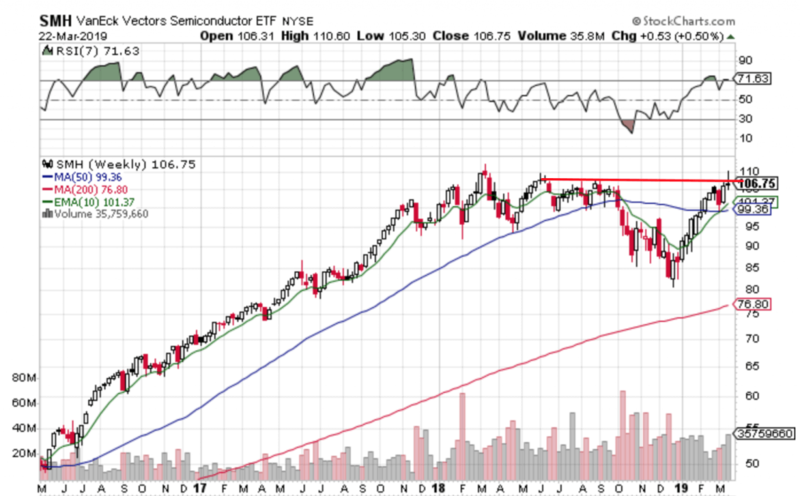 After a strong start, you can see on the weekly chart below that the highs were sold and the SMH semiconductor industry ETF reversed. The other reason I wanted to point out this group is because of the context. Not only is this a growth industry but, the chart has rallied all the way back to resistance and looked like it was ready to breakout (before flopping lower). So this week I’ll be watching to try and see if this is just choppy volatile trading, or the start of a more serious breakdown. 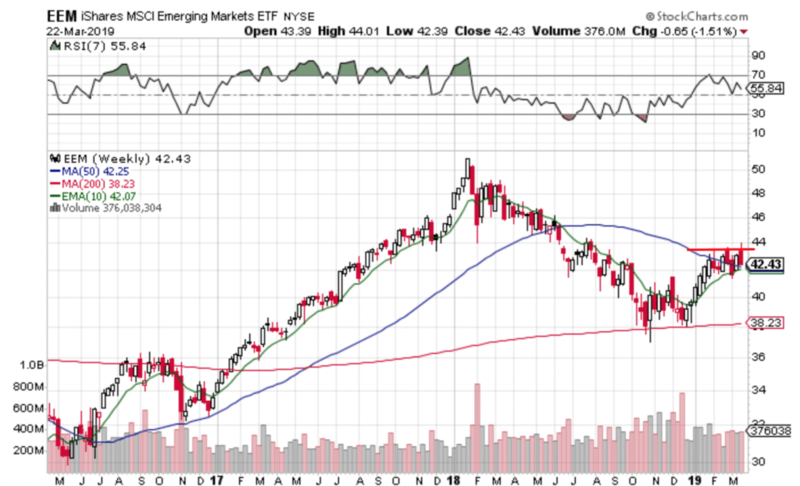 And along the same lines, emerging markets are also of interest (and can be tracked easily with the EEM ETF). 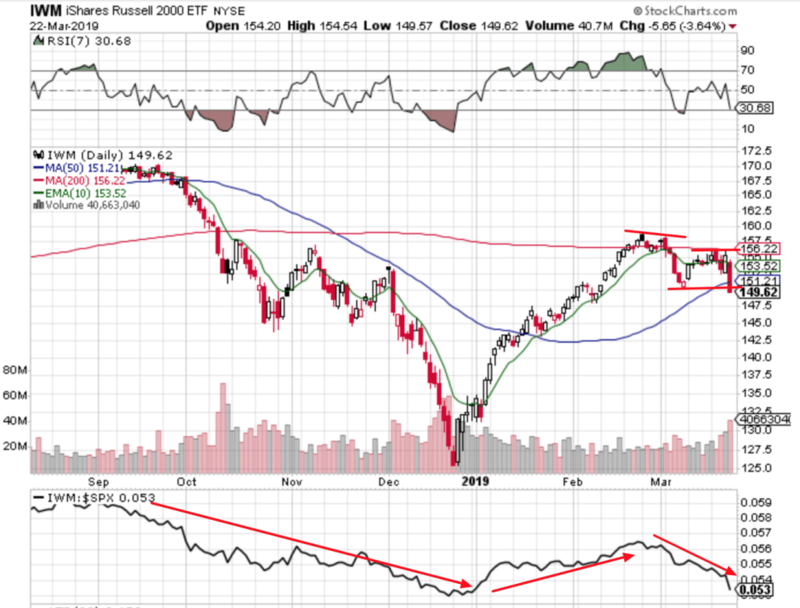 This is another asset class that’s been trying to breakout but has struggled to move much. And again, we’ll see if these stocks just fall back into their trading range for a little while longer, or if it’s the start of something worse. To really get excited about equities though, I’d like to see a higher high out of this part of the world. 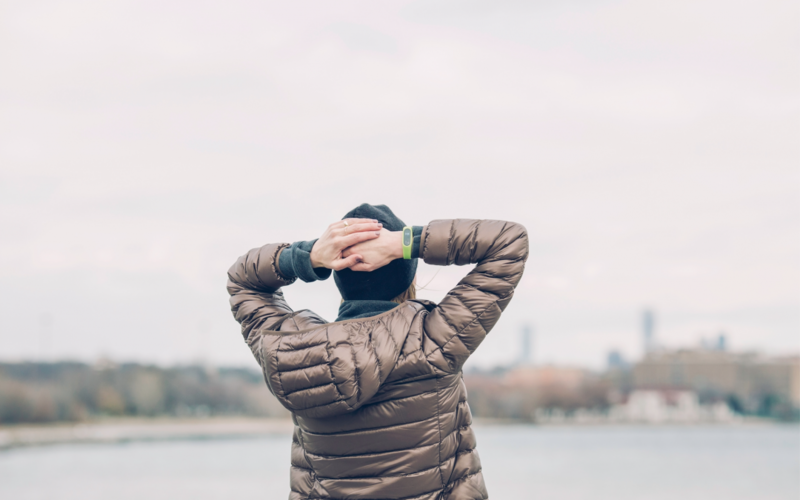 While there’s no shortage of fear-inducing headlines in the media – including some valid points about slowing global economic data – the price action is ultimately what you bank on. So that’s where I’ll continue to look for signals amidst all the noise as the first quarter of 2019 comes to a close. Now on that note, should stocks actually bounce back this week, I want to be ready with some ideas. So let me show you a few of my favourite charts at the moment. Because the market route on Friday was so widespread, there aren’t too many stocks that closed out the week at 52-week highs, (which happens to be my preferred entry signal). But there are still lots of stocks near their highs. So if the market gets going again, these are the tickers I want to focus on! 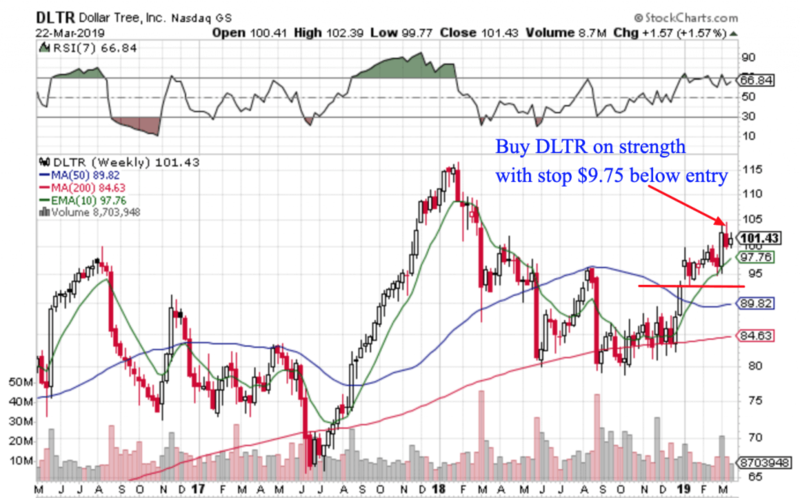 First up, Dollar Tree (DLTR) has my eye this week because the stock has consolidated quite well despite the recent volatility. It also caught an upgrade this week and after beating earnings earlier this month it may be able to keep moving. 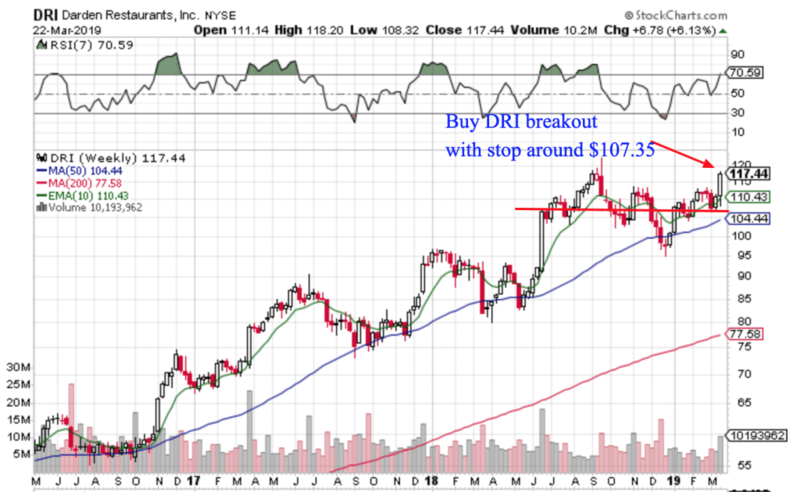 Since this breakout is happening in the context of a longer-term uptrend, and since it was driven by strong fundamental results, I’m optimistic DRI can keep moving. 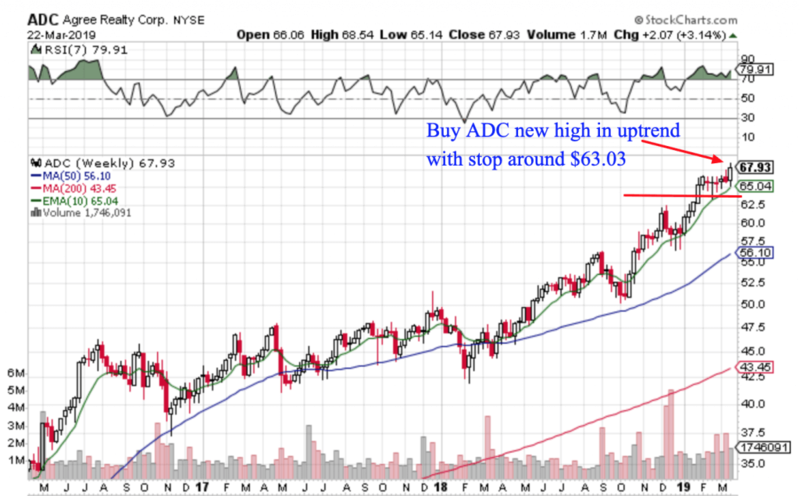 With the REIT space acting pretty well overall, I’m hoping this stock may benefit from some top-down tailwinds to keep it coasting higher. 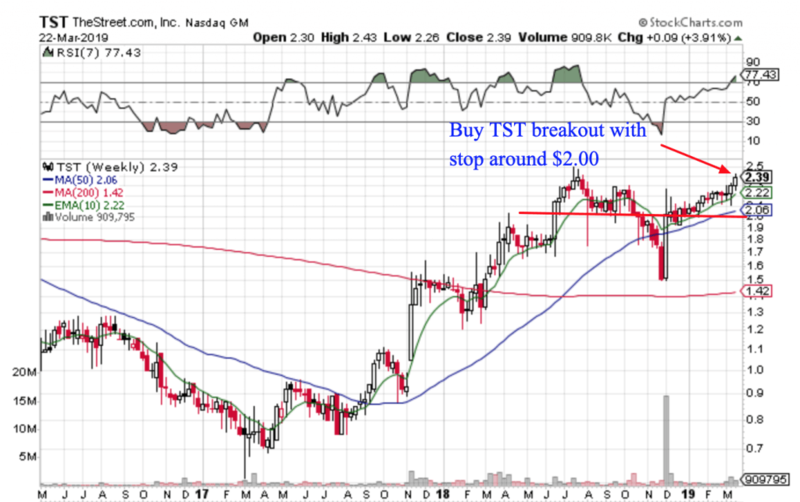 With the chart near 52-week highs, I think TST could be worth a shot as long as you manage risk and have a plan for when to exit. If the market overall cooperates the odds should improve too.